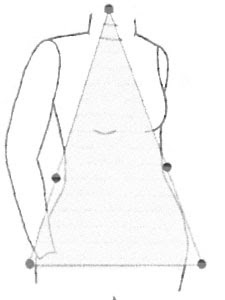 The last body figure to be discussed in our series is the pear shape. Another feminine body type which also happens to be mine. Similar to the hourglass, the pear has a narrow and distinct waist, fuller bust however the hip area is conspicuously proportioned larger than the bust area. In order to create balance and an imaginary hourglass figure the idea is to draw attention away from the hips. This can be done by wearing darker colors in pants and skirts. Wearing fitted not tight, flat and no pocket bottoms. Keep in mind you do not want tight pants but loose, straight leg or boot cut jeans. I like to wear a wrap dress with a flat panel on top. Now that you've de-emphasized on your problem area draw attention upwards on your body. Wear colors, prints, heavier fabrics on top. Princess line dresses also look flattering on this body type. New Fall Series Launch: Now that you can identify some ways to flatter your particular body type and create a balanced flattering look-let’s take a look at colors. Which season are you? Shopping Tip: I enjoy wearing the thREDs by Sandra tunic tops available at Global Trendzz. The embroidery draws attention upwards towards my face and chest. The longer length covers my hip area gently. The cut of the tunic comes in slightly at the waist. In short, my problem area is nicely covered and emphasis is created above causing my body to look perfectly in proportion. Plus it’s so comfortable to wear! Apparel Industry Professional blogs about fashion, dress and fabric issues that relate to the everyday wearer of clothing! Heads Up! Show me that Profile! Fashion in the MIddle East: High Fashion Covered Up!